On this page I will provide brief answers to the most frequently asked questions about dwarf hamsters. I shall be adding new questions periodically, but obviously I can't answer every query here and if you have a question that is not covered, I would suggest joining one of the friendly advice forums listed under the Links page. Below is a list of the questions currently included on this page; please scroll down to read the answers. 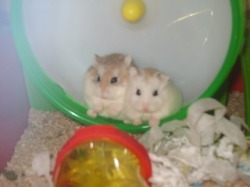 Can I put my dwarf hamsters together?/Shall I buy a new friend for my current dwarf? 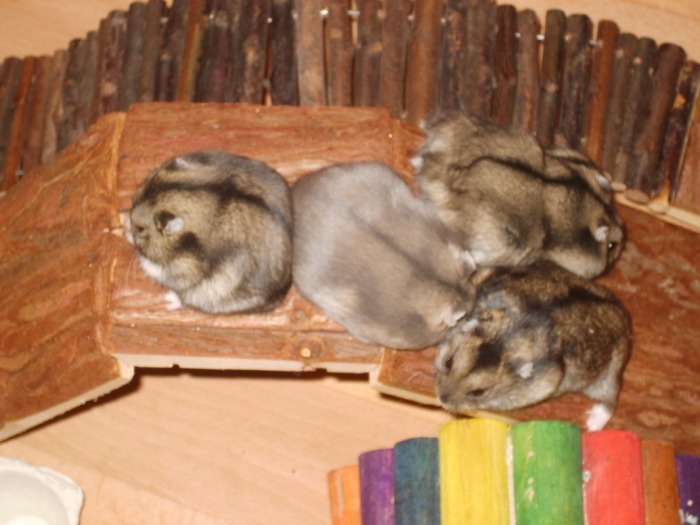 How long do dwarf hamsters live? Should I bathe my hamster/Can hamsters swim? How can I prevent over-grown teeth and nails? Can I wake my dwarf up during the day? What foods are suitable for dwarf hamsters? Why doesn't my dwarf use his tubes? 1. CAN I PUT MY DWARFS TOGETHER/SHALL I BUY A NEW FRIEND FOR MY DWARF? No, not unless they are babies. By the time they are old enough to be sold, they are too old to be paired up. Dwarfs who are siblings can live together happily, but once separated, even for a day, you will not be able to put them back together as they will have forgotten each other's scent. Sometimes, it is possible to introduce 2 adult dwarfs, but this needs to be done carefully; you cannot just put them together and I would advise against buying a new dwarf to put with an existing one. 2. HOW LONG DO DWARF HAMSTERS LIVE? However, this is assuming that the hamster does not get ill and dies naturally of old age. It is quite common for hamsters to develop fatal illness between 18 months and 2 years old. Obviously all hamsters are different and some may live longer than this or die at a younger age for no apparent reason. I have found that Roborovski hamsters seem to be much hardier than other species; most of my robos have died through old age rather than illness. This is probably because they haven't been on the pet market as long as other species and are therefore not as inbred. 3. SHOULD I BATH MY HAMSTER?/CAN HAMSTERS SWIM? No, you should never bathe your hamster. 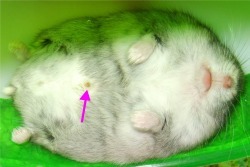 Hamsters wash themselves like cats, using special saliva and do not need bathing. Hamsters can swim to an extent, but they should never be put in water. Getting a hamster wet is dangerous as it can give them a chill and cause them to get sick. It would also cause them stress and could lead to stress-related illness. A hamster would never choose to swim or get wet in the wild. Dwarf hamsters have a scent gland on their belly, which is especially noticeable in males. Yellow stains are caused by secretions from this gland and are nothing to worry about. If there appears to be a crust or scab over the gland, this is caused by a build-up of secretions. The crust can be removed gently using a fingernail, or by dipping a cotton bud in warm water and gently wiping the crust until it comes away. 5. HOW CAN I PREVENT OVER-GROWN TEETH AND NAILS? To prevent over-grown teeth, make sure your hamster has plenty of things to gnaw on. Most pet shops sell wooden blocks and things in the shape of fruits, for example. These aren't very effective as most hamsters ignore them. They prefer to chew on things like cardboard boxes/tubes or hard-baked treats such as honey sticks. I provide my hamster with the dog biscuits called Biscrok or milk bones as these are safe for hamsters. 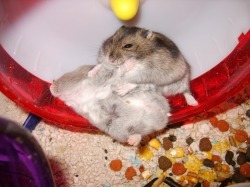 Female hamsters chew on things a lot more than male hamsters. If a hamster has these things to chew, the teeth will usually not become over-grown. I have never had to have a hamster's teeth clipped. To prevent over-grown toe nails, provide your hamster with wooden toys such as wooden bridges, huts and ramps for example or a rough stone or terracotta tile to stand on. I always replace any plastic ladders with wooden ramps, which can be bought from ebay. NEVER PUT SANDPAPER IN YOUR HAMSTER'S WHEEL as this will cut their feet. I have never had to trim a Syrian's nails, however dwarf nails seem to grow faster and need the occasional trim. You can have this done at the vets or take your hamster to a show and ask to be shown how to clip them yourself. If you feel confident, have a go! Don't hold the hamster too tight and simply use some nail scissors to snip off the tips of the nail. Don't cut too far down as you will cut the vein that runs through the nail. For more advice, try one of the forums listed under the links page. 6. CAN I WAKE MY DWARF UP DURING THE DAY? Generally, it is not a good idea to wake any hamster up during the day as they won't be very happy about it (imagine being woke up during the night!). Unlike Syrians, dwarf often get up in the day to potter about and don't seem to have such strict waking/sleeping hours as Syrians and therefore aren't quite as grouchy as a Syrian if they are woken during the day. I find that dwarfs nap and wake throughout the day and night, but are generally much more active during the night. 7. 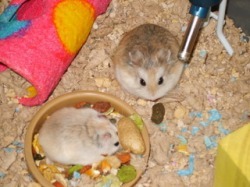 WHAT FOODS ARE SUITABLE FOR DWARF HAMSTERS? Dwarf hamsters pretty much eat the same foods as Syrian hamsters, with a couple of major differences. Firstly, dwarfs love mealworms, millet and small seeds where most Syrians aren't really interested in these. Secondly, some dwarfs bought from pet shops may be prone to diabetes. Roborovski and Chinese do not have a problem with this, but dwarfs labelled as Campbells, Winter White or Russian are most likely hybrids containing some Campbell traits. One of these Campbell traits is a tendency towards diabetes. If you have one of these dwarfs it is advisable not to feed them any treats containing sugar such as yogurt drops, honey sticks, vitakraft treats and basically any shop-bought processed hamster treats. Avoiding such treats could help to delay or prevent the onset of diabetes. Personally, I feed a basic mix of Harry Hamster with lentils and barley added. For a treat, I then feed one small portion of one of the following each day: a small piece of a vegetable (such as carrot, broccoli, spinach), a piece of cooked pasta, a tiny bit of wholemeal toast, a piece of chicken, a spoonful of porridge, 2 mealworms or a shop-bought treat such as a yogurt drop. Note that these items are treats and hamsters do not need them to survive. Hamsters do not need a bowl of vegetables each day - feeding too much veg will give your hamster diarrohea, which could be fatal in severe cases. An appropriate daily portion would be half a spinach leaf, for example. Once a week I give each hamster a larger treat, which lasts them the week. I would give them one of the following per week (or fortnight, depending how long it takes them to eat it): a spray of millet, a Pedigree Biscrok biscuit, an egg biscuit, a Vitakraft Ravioli. Basically, anything that's dried and larger than a daily portion is suitable for a weekly/fortnightly treat. 8. WHY DOESN'T MY DWARF USE HIS TUBES? Most likely because they are too steep for him. Syrian hamsters have bare skin on the soles of their feet, with pads that act like suckers. This enables them to climb vertical tubes. Dwarfs do not have these and instead have a covering of fur on their feet. This means that they cannot climb tubes unless they are at a very shallow angle and have ridges inside. 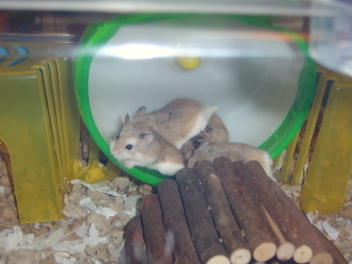 Chinese hamsters can climb steeper tubes than other species of dwarf. Some pairs of dwarfs stay together for life and other pairs need to be separated if they are fighting. The first thing you need to be able to do is spot the difference between normal squabbling, dominancy fighting and the type of serious fighting which may cause a pair to need separating. Normal fighting tends to look a bit like boxing or often involves one hamster being pinned on the floor by another. Depending on the species, there may be a lot of squeeking involved, making it sound worse than it is. A fight is more serious if it involves one hamster often being chased around the cage at speed or if biting is involved (although don't confuse this with grooming). As a general rule, if a hamster is injured by another in a way that blood is shed, then you will need to separate your pair. Campbells Russian Dwarf: These hamsters often live together in harmony in pairs or groups of 4. Roborovski Dwarf: This species is quite sucessful when kept in pairs or groups up to 4, but Robos do sometimes need to be separated. Winter White Russian Dwarf: These hamsters can be kept in pairs, but often need separating and the owner needs to be prepared for this. I wouldn't recommend getting a group unless you are experienced with keeping Winter Whites. Chinese: males can be kept in pairs, but often need separating. Female pairs nearly always have to be separated. I would not recommend keeping a group unless you are experienced with Chinese and I would never keep a group of females.